President Donald Trump tweeted Friday that he authorized a doubling of "tariffs on Steel and Aluminum with respect to Turkey." Losses in the the Turkish lira deepened on Trump's tweet, falling as much as 20 percent versus the U.S. dollar in Friday trading. Losses in the Turkish lira deepened on Trump's tweet, falling as much as 20 percent versus the U.S. dollar in Friday trading. "As he stated, the President has authorized the preparation of documents to raise tariffs on imports of steel and aluminum from Turkey. Section 232 tariffs are imposed on imports from particular countries whose exports threaten to impair national security as defined in Section 232, independent of negotiations on trade or any other matter." 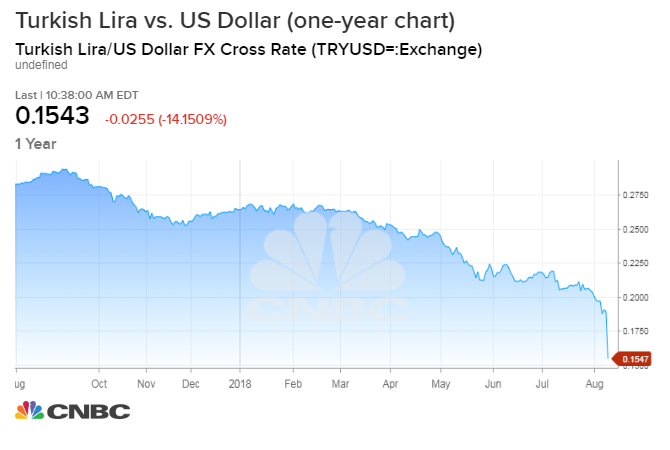 The currency was already reeling Friday after comments from Erdogan, who called for citizens to convert their foreign currency holdings into lira. So far there has been no confirmation to CNBC of the new tariff policy from the U.S. Department of Commerce. Late Thursday, and before Trump's tweet, Erdogan said he would stand up to pressure from the United States. The brewing dispute comes after a Turkish delegation returned from Washington with little to no progress on the detention of U.S. evangelist pastor Andrew Brunson, who is charged with supporting a group blamed for an attempted coup in 2016. Last month, Trump threatened to slap "large sanctions" on the longtime NATO ally if it refuses to free Brunson. The U.S. then announced on Aug. 1 sanctions on Turkey's Justice and Interior ministers, prohibiting U.S. citizens from doing business with them. "It's really mind-boggling, especially with Turkey going through a crisis right now," said Win Thin, global head of emerging markets strategy at Brown Brothers Harriman. "I won't say it's unprecedented, but it's certainly unusual. ... You've got two very strong-willed, stubborn leaders and neither seems like they're going to back down." The increase in the metal levies also follows Trump's decision earlier this year to impose tariffs of 25 percent on imported steel and 10 percent for imported aluminum in an effort to protect American business. "People have no idea how badly our country has been treated by other countries. By people representing us who didn't have a clue," Trump said in March, arguing that trade trends "destroyed" American steel and aluminum industries. — CNBC's David Reid, Gina Francolla and Reuters contributed to this report.